When it comes to the use of Healing stones, there are very few cautions that we have found. Of course, one must always take care not to break or injure a stone. Sometimes this is inadvertently done when carrying stones on our persons. Always be sure to keep your stones enclosed in a soft, sturdy, natural material covering. The covering will lessen the shock and damage if the stone is accidentally dropped, such as falling out of a pocket. It is never a good idea to carry stones in the same area as keys, money, or electronic devices. The energies of the stones can damage the electronic device, and the electromagnetic energies of the device interfere greatly with the Healing abilities of the stones. It is always important to cleanse the stones routinely, especially when they are first purchased. There are those who maintain that Healing stones can be programmed for negative deeds. It is our conclusion and instruction from Archangel Raphael that this is not possible. While Healing stones are sentient beings and have Free Will and Choice just as any other being of consciousness has, they have evolved beyond the scope of negative entity possession or directive. We do have a caution for you regarding the overuse of stones. 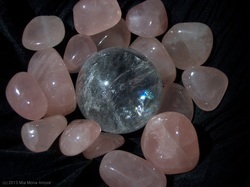 If you are using your stones as Healing partners, pay close attention to their color and clarity. If clear stones become cloudy or opaque stones become dull, stop using them immediately! They will require cleansing and charging as soon as possible, and quite probably a long rest on a crystal cluster. 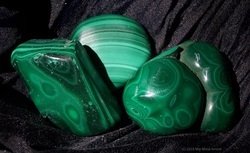 In the photos here, you see two different versions of the stone Malachite. As you can see, one is rich and vibrant with color. This is the way Malachite should look. The other photo shows two pieces of a dull, drained stone. 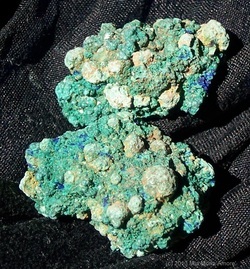 Unfortunately, this stone – it was once a Malachite nodule - is very nearly “dead”. It gave its Life in the Healing of a concussion. As the recipient of this Healing could not see the stone, she did not see that the color was draining out of the stone until it split into two parts and fell off her forehead. This stone literally gave its Life to this person. She recovered from her head trauma well. The stone has not. This is a sad, yet very clear, illustration of how a stone can be overused, injured, and even killed. Another caution we have to share is for those of you who are attracted to Tiger’s Eye (pictured at right). This beautiful stone draws many to its great beauty and ability to ground and Balance energies. It is truly a spectacular and remarkable Healing and Life partner. However, Tiger’s Eye has the ability to make others unseen. For those of you who like to wear or carry Tiger’s Eye, you should know that sometimes others will not be able to see you. This is not always the case, but at times, you will be very much invisible to those around you. While this sounds very inviting and presents the potential for some good fun to some, it can be very dangerous. If you are walking across the street, motorists may not see you. We have had a number of occasions when we were carrying or wearing Tiger’s Eye while we were driving and other motorists did not see us. We have very narrowly avoided accidents more than once before we learned that this stone can cause its holder to be unseen by others. Tiger’s Eye is well worth the extra caution necessary in using it, as it is a great Healing and meditation stone. It also makes for very beautiful jewelry.